Investigating Agatha Christie's Poirot: The future of Poirot: 'Introducing Poirot for a new generation'? 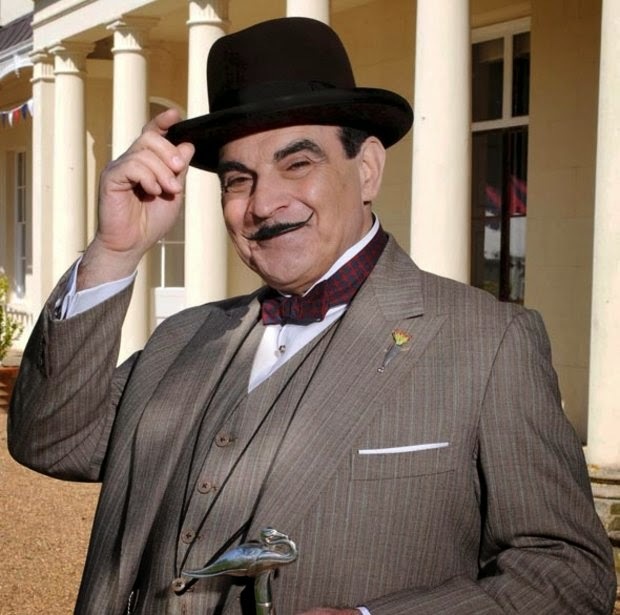 Coinciding with the 125th anniversary year of Agatha Christie in 2015 (and, without a doubt, the end of Poirot on ITV), the BBC has struck a deal with the Agatha Christie estate for exclusive rights to make Christie adaptations. Two dramas have already been commissioned: Partners in Crime, which will feature Christie's sleuths Tommy and Tuppence Beresford, and And Then There Were None, a re-make of the classic story. Of course, none of these are Poirot adaptations. However, if we are to believe the Daily Mirror, exciting discussions about further options are ongoing, and 'Both Marple and Poirot could be revisited further down the line'. Also, the official Agatha Christie Ltd press release mentions that RLJ Entertainment and Acorn Productions (the new rights owners) are working towards developing the Christie stories 'for a new generation'. Both these statements seem to suggest that a modern-day Poirot or a Belgium-set Poirot prequel (as suggested by Suchet in an interview) is at least being considered. Now, personally I don't see any of those options working. First, Suchet is synonymous with the character; both his performance and not least his accent would be impossible to copy. Second, Poirot as Christie wrote him is very much a character grounded in the inter-war years. I can't see him working in a modern-day context. Third, I fear a period prequel following his years in the Belgian police force would be distracting and potentially damaging to the original character. Having said that, I was convinced a modern-day Sherlock and an Inspector Morse prequel would never work - and then the brilliant Sherlock and Endeavour series proved me wrong. So let's wait and see what happens. We should never say never. Even if Suchet will never be surpassed - of that I am remain convinced. Speaking of replacing Suchet - a remake of Murder on the Orient Express has been announced! I must admit my expectations are incredibly low. I assume Suchet won't be involved. He has been very positive about his own MOTOE adaptation (2010), so there's no reason why he would want to do a remake so soon after that episode. Consequently, they would have to find a different actor to play the character, so soon after the end of Suchet's reign. I'm convinced most Christie fans will find it difficult to adjust to a new screen Poirot already. Also, I'm not convinced the producers, including Ridley Scott (best known for his Blade Runner and Gladiator films) and Simon Kinberg (from the Downey Jr. Sherlock Holmes films) are the right team for the job. But again, I reserve judgement for the end product. Admittedly, Sophie Hannah's Poirot novel was announced ages ago (read my blog post on that here). But news have recently emerged of a massive marketing campaign, so I thought I'd mention it again. I've promised to reserve judgement on this, too, and I wish Hannah the best of luck, but I'm not convinced there's a need for a new Poirot novel. Taken collectively, these pieces of news tell an interesting tale of the future of Christie and Poirot. Christie's grandson Mathew Pritchard and the new rights holders all seem prepared to introduce the character to 'a new generation'. We already know this will entail a new film adaptation and a new novel, and chances are he will be revisited on television some time in the future, too. What will come of these efforts is hard to know at this point in time, but I think we can say that Poirot is by no means dead and buried. Suchet never received the BAFTA or the National Television Award I was hoping for, but he WAS awarded the Royal Television Society's Lifetime Achievement Award for his achievement as Hercule Poirot. Well deserved! My apologies for the long blog silence. I have had a busy couple of months. But fear not, I aim to do several exciting blog posts in the months to come! Great to see you back, I assumed this blog had died out. I look forward to updates on these (somewhat worrying) topics. Great to see you back blogging and thanks for this great summary! Thank you! And thanks for clearing that up! Will certainly keep up to date with news from you. Great reading, I think the same of your right now. I will go on record in saying that it there is a murder mystery which can be called as "Unputdownable" then Agatha Christie's "And then there were none" is the one which aptly holds this coveted title. A real page turner...I started reading this book at 11 PM in the night and finished at 2 AM early morning without a break...this is such an engrossing story that you would be slowly entangled in the web woven by Agatha Christie and won't be able to escape till you read the last page and the last line. You will keep on guessing the murderer's name and would guess it wrong each time. None of the murder mysteries of any other authors hold a candle to "And then there were none". As a die hard fan of Agatha Christie I hold this book in the highest reverence. Thanks for the news about Poirot, Christie, etc. Did you read the novel by Hannah ? I won't. I agree with you; there's no need for new Poirot novels.